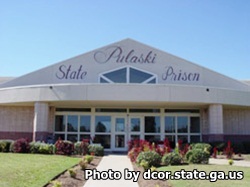 Pulaski State Prison is located in Hawkinsville Georgia. It is a medium security institution that houses approximately 1,223 adult females. Inmates are housed in triple, double, and single cells. This facility provides work crews to various government agencies that provide a labor force. Inmates can take courses to receive an adult basic education, learn to read, and obtain a GED. Offenders can also receive counseling for parenting, family violence, substance abuse, and get career and re-entry counseling to prepare the inmates for their release. The Chaplains office offers bible study, an inmate choir, and various worship services. Vocational skills that can be acquired at this institution are culinary arts, clerical, computer technology, laundry, cosmetology, law, landscaping, custodial maintenance, plumbing, automobile repair and maintenance, veterinary technician, and graphic arts. Visiting is 9am-3pm on Saturdays, Sundays and State Holidays.